He was the most famous and best ballplayer of his generation. She was America's blonde. They were intense, impassioned lovers, and, long after that, gentle and loving friends. The only thing that didn't work between Joe DiMaggio and Marilyn Monroe was their marriage. 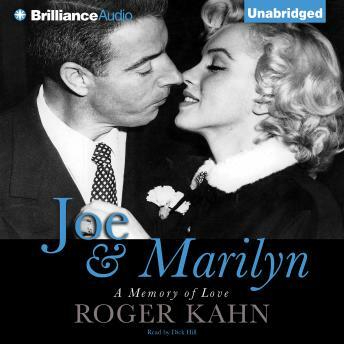 Joe & Marilyn is a portrait of DiMaggio, as godlike as his legend on the field, but vulnerable and intensely human off and of a stormy Marilyn of whom it was said, "She doesn't need a husband. She needs salvation." After DiMaggio retired from baseball, he saw a publicity photo of Marilyn and his courtship began. She was reluctant to meet him fearing an old, vulgar ballplayer and instead finding a poised and graying man-"a little shy, like me"-impeccably tailored and financially secure. When they married in 1954, reporters called them "Mr. and Mrs. America." But their married life was strained from the start. She was messy. He was compulsively neat. He wanted a certain primness and she liked to show her storied body. The marriage lasted nine months. In later years as Marilyn drifted through mental illness, DiMaggio reappeared as a stalwart friend. But even he could not rescue her. In the end all that was left for him was to plan her funeral. He barred some of Hollywood's most famous names. Why? "Because they killed her," he told a friend.